You are here: Home / Search for "catalogue"
Brochures from Geo Strategies which can be downloaded for reference purposes. Below, you will find direct links to all our main product brochures. Geo Strategies has a variety of databases for Romania selected and maintained for data-driven analysis, network optimisation and marketing projects. The key to value-added analysis, segmentation and profiling is to combine internal and external data. Internal data typically includes an address, spend (or transactions and savings in the case of a bank) and spend frequency. Ideally, there will be more but this is a good start. In addition, there may be relevant market research data but this is ephemeral i.e. it tends to be a snapshot in time and, with the rapidly changing nature of consumer habits, this tends to become out-of-date very quickly. The data concerned is a combination of point data (e.g. 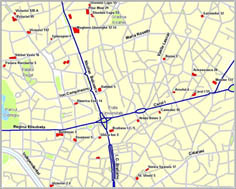 the location of shopping centres, supermarkets, banks, etc.) and area data (e.g. population counts, property type and car sales). Area data is available at various levels (locality or postcode) depending on the granularity available but can also be supplied as grid data. See the Data and Services Catalogue for more detail. Geo Strategies specialises in geo-demographics for Romania based on comprehensive geographic databases, data modelling and interpretation. Geo-demographics are sometimes referred to as neighbourhood classifications. They provide a summary of a broad range of characteristics about those people who live within these neighbourhoods. These classifications are attached to individuals by their home address, and more prevalently by just the postcode. In the image above, the classifications relate to – Education, Age, Ethnicity and Employment. See also our Data and Services Catalogue. 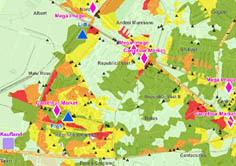 Geo Strategies supports customers with their specialist GIS needs. These range from modest requirements for site evaluation to network planning and substantial investigations as part of the due diligence process. Geo Strategies provides a wide range of consultancy and local support in GIS systems, data analysis and management, retail planning and optimisation, consumer insight and location-based decision-making. Together with Experian, we provide a further range of consultancy (national and cross-border) in economics, real estate, market research, and the public sector. Geo Strategies offers consultancy and support to customers, from scoping requirements and specifications, to delivering fully fledged systems for use on desktop PCs or networked, web-enabled infrastructures. All delivered together with maintenance, support and training in the local language, together with applications consultancy. Geo Strategies works closely with customers to refine their data management strategies. Identifying spatial and behavioural correlations can help identify quick wins. Once these are communicated internally, they often result in major improvements in business performance. Large datasets are all-too-often repositories of valuable information hidden within their midst. Data mining, especially when combined with a behavioural element, can unlock valuable insight and support for personalised communication. 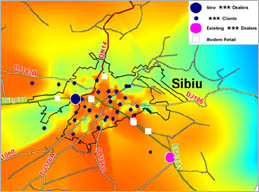 Geo Strategies provides catchment analysis and modelling in support of many retailers in Romania for planning their networks, forecasting sales and managing their relationships with existing customers and also to target new ones. Using our extensive specialist data and local expertise, we develop models of trading areas, expenditure patterns and market size based on a detailed knowledge of the market structure in the catchment area of current or prospective outlets. 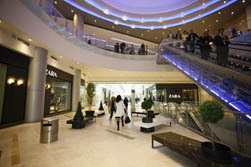 Geo Strategies also works with customers to interpret footfall figures; these are an important Key Performance Indicator which also combined with other KPIs, such as sales data, to provide management information capable of helping to drive improved productivity from both shoppers and staff. KPIs are used as a basis for planning, running and organising stores, also to understand strategic or tactical market opportunities, and to optimise the number of customers who visit the stores. Geo Strategies maintains a variety of administrative boundaries – including 6-digit postcodes – and the associated databases for Romania with points of interest, bank locations and much more. 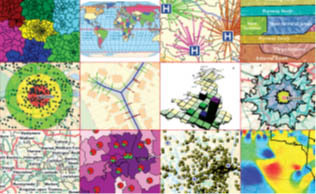 Geo Strategies also develops and maintains a variety of more specialist datasets for business and similar applications. The uses range from advanced logistical planning and management, utilities management, regional TV planning, security, banking and retail. In addition to the list above, Geo Strategies maintains a variety of databases which can be geocoded so that they are suitable for spatial (GIS) analysis. 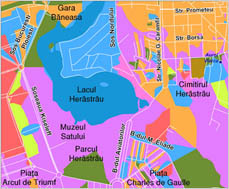 Geo Strategies maintains the most detailed topographic, hydrographic and road maps for Romania as well as administrative boundaries and linked databases of commercial information. Geo Strategies divides its mapping for Romania into two categories: Standard Mapping and Value Added Mapping. The projection is Lat/Long WGS-84 and the data can be delivered in virtually any format. Geo Strategies maintains a range of databases and mapping for Romania including topographic maps, a terrain model, road network, administrative boundaries and much more. Geo Strategies has unrivalled map coverage for Romania ranging from topographic mapping at a variety of scales through to a highly accurate terrain model for hydrological modelling and telecommunications planning. Our maps have been used for a wide variety of applications including below-ground radar for archaeological excavations, a flight simulator, maps for weather forecasting, for retail network planning, for health monitoring and for border control. The topographic datasets are organised and structured according to ISO TC-204-N-34 which ensures that they can be used with all advanced technology platforms. 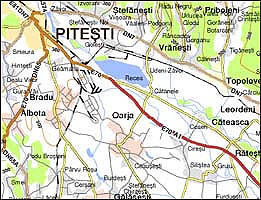 Geo Strategies provides mapping and GIS services – predominantly to customers with an interest in Central and Eastern Europe (CEE). 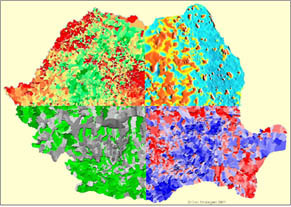 Geo Strategies is a leading supplier of data capture, map data, GIS software and related services for the GIS market. In particular, Romania is very central to our developments. We have created a variety of small and medium scale mapping for Central and Eastern Europe (CEE) and for the Middle East which includes topographic maps at various scales, land cover maps, clutter maps (for the telecoms industry), hydrology and a number of specialist maps. While we do supply map data for countries throughout the world, our focus is on Eastern Europe – especially Romania for which we have a wide variety of general and specialised mapping together with the associated databases. These are more fully described in our Data and Services Catalogue.